Get pizza delivered right to your door with the tap of a finger. Being able to get food delivered to your doorstep was once a dream. Now it’s possible. No longer is it necessary to get dressed and go through the hassle of getting out of bed. One click is all it takes to get a steaming pizza at your door. Let’s praise the apps that make these deliveries happen. One of the best known apps to all pizza lovers is the Dominoes Pizza App. It conveniently lets you create a profile and, from then on, all you need is a simple motion from your finger to make your delivery. A person’s options aren’t completley limited to pizza. The user can choose from Dominoes’ vast menu, whether it’s pasta or a sweet tooth. The app even has a neat feature where you can track your order and know when it comes out of the oven. However, what doesn’t give this app an A is the fact that it is limited to Dominoes and not everyone may be a fan of the chain’s options. “Sometimes I’m not in the mood for Dominoes so I am forced to turn to other apps that give me more options,” sophomore Alexa Velez said. Postmates is known to be the Uber of stuff. It is not limited to only pizza or Chinese food like a common delivery app. This app changes the delivery game. Whether you are perfecting a recipe and forget the cheese or need your dry cleaning, Postmates has you covered. This app is a lifesaver for forgetful people, going to the extent of delivering anything from drug store products to clothes. Yet, such a tremendous app receives plenty of backlash. People say it alters life to the point where people will become too “lazy.” Others complain that the deliveries are pricey making consumers lean towards settling for pizza apps or going to the supermarket themselves. Postmates still dominates the market; people love choices and that is what Postmates offers, which gives it a whopping A rating. No longer is there a need to stress whether a restaurant delivers or not. With GrubHub, you simply type the restaurant’s name and you can find out if they offer delivery. Now, if you’re a restaurant owner looking to promote on a delivery application, GrubHub has a major set back. GrubHub’s services are quite pricey so many restaurants do not use GrubHub. As a result, the restaurant you love may offer delivery, but not through GrubHub. GrubHub also limits its services to only restaurant deliveries unlike Postmates. 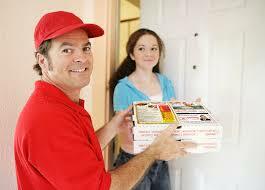 Whether its pizza, food or even groceries, it can be delivered right to your house in a matter of minutes. Life is quickly evolving and things that were thought impossible are now becoming a reality, delivery being one of those things.